New restaurants are popping up left, right and centre in the City of Sails. And, while we’re all for trying new things, sometimes you just can’t go wrong with a classic—especially when we’re talking about one of Auckland’s best restaurants! Since opening in 1994, it’s fair to say Cibo has stood the test of time. The Parnell gem excels in all avenues—the food, drink, atmosphere and service are all incredible. Here’s why we’re still so obsessed with this Auckland gem. It’s One Of The Most Beautiful Restaurants. Ever. Cibo is sure to impress with chandelier-lit booths, white table cloths and walls adorned with cherry blossoms. The outside courtyard doubles as an inner-city oasis with lush surrounds and a bubbling fish pond. And while the restaurant is oh-so glamorous, it’s far from being stiff—you’ll want to eat (and drink!) the day away here. And The Food? It’s Equally Beautiful! The beautiful surrounds are just the beginning at Cibo—the food is also stunning. 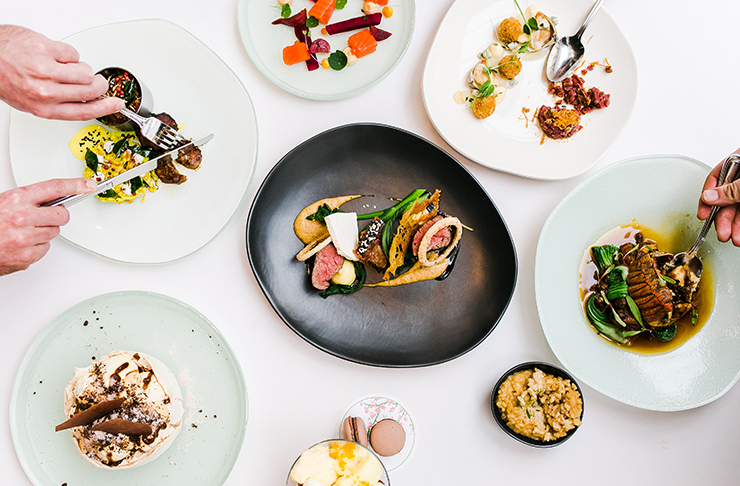 Whether you’re visiting for lunch or dinner, you’ll discover delectable dishes showcasing seasonal produce. There’s something for every taste bud with everything from duck and prawns to venison and fish. Rest assured, vegetarian folk won’t go hungry with equally delish numbers. Whatever you opt for, we can guarantee it will be plated like a piece of art—the kitchen team are hella talented! Psst! We’re about to let you in on a secret. Cibo has the best lunch deal in town. Across weekday lunchtimes, you’ll find a two-course express menu for just $44. The choice is yours whether you want an entrée and a main, or main and a dessert—you can have all three for an extra $5! Start with the likes of Ora King salmon or a whitebait fritter (our fave) before moving on to roasted hāpuka, Char siu pork belly or pastrami-rubbed lamb. Lunch doesn’t get much tastier than this! On the menu since forever, Cibo serve the best—and biggest—pavlova in town. Perfectly crispy on the outside and fluffy on the inside, Cibo has not one but two pavs. The salted caramel number stars toffee peanut brittle (yes, please!) and chocolate dust. 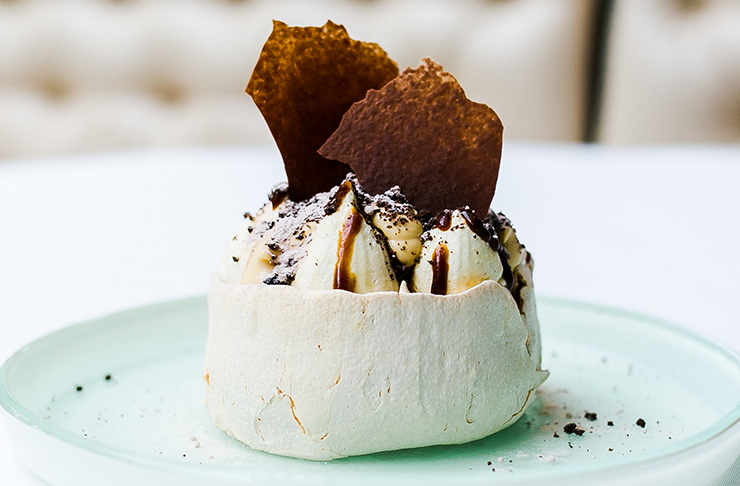 The tiramisu pavlova is all about coffee puree, masala-spiced caramel and cubes of coffee jelly. A word of warning: this dessert is huge—share it with your dinner date/s. If pavlova isn’t your thing (who are you even? ), Cibo has an abundance of incredible desserts. Your sweet tooth will be spoilt for choice with gingerbread pudding, roasted pineapple lemon tart and a chocolate toastie (yes, you read right—chocolate toastie) made with French Valrhona chocolate. Our advice? Visit on the reg so you can slowly but surely eat your way through ‘em all. Cibo know their Syrah from their Shiraz! Bring your reading glasses because Cibo’s wine list is looong… and incredible! The vino is sourced from New Zealand and beyond with everything from Gewürztraminer and Chardonnay to Pinot Noir and Cabernet. If you’re here to celebrate, the Champagne menu is particularly epic. Anyone for blush rosé champers? They Know How To Party! Speaking of bubbly, Cibo know how to host a party! Cocktail party, birthday celebration or even your wedding… there’s no event too big or too small. Whether it’s a casual shindig or lavish dinner party, the restaurant—and tranquil courtyard—is the perfect venue for your function. Nab a table for Melbourne Cup Day—they’re throwing the best party in town! Think Champagne on arrival, canapés and a divine four-course meal. To get amongst the antics, dig out your fascinator and book your tickets here. So, what are you waiting for? Discover the Parnell gem for yourself! For more details on Cibo, including opening hours, click here. Editor’s note: This article is proudly sponsored by Cibo and endorsed by The Urban List. Thank you for supporting the sponsors who make The Urban List possible. Click here for more information on our editorial policy.